CHAMPAIGN, Ill. - For the second straight weekend, the Nebraska volleyball team knocked a Big Ten team from the ranks of the unbeaten as the Huskers defeated No. 7 Illinois, 3-1 (25-14, 19-25, 25-17, 25-19), in front of a crowd of 3,569 at Huff Hall on Saturday night. The third-ranked Huskers (13-1, 4-0 Big Ten) extended their win streak to 13 matches and have won a nation-leading 10 straight matches on the road. Nebraska has won 18 straight Big Ten matches dating back to last season, and Saturday's win came against the previously unbeaten Illini, now 14-1 overall and 3-1 in the Big Ten. Last week, Nebraska beat then-undefeated Michigan. Set 4: Nebraska's block got them off to a strong start once again with Schwarzenbach combining with Hames and then Sweet for a 2-0 edge early on. A kill by Schwarzenbach and an ace by Densberger helped extend the lead to 7-3, and a kill by Sun forced an Illinois timeout as the Huskers led 9-4. Illinois trailed by six before pulling within 13-11 after a 4-0 spurt. But Sweet earned sideout for Nebraska and Illinois hit the antenna to make it 15-11. The Illini pulled within two again, but Foecke and Sun posted back-to-back kills for a 19-15 Husker lead. The teams traded sideouts for the next four rallies before an Illini hitting error and a block by Schwarzenbach and Sun made it 23-17. 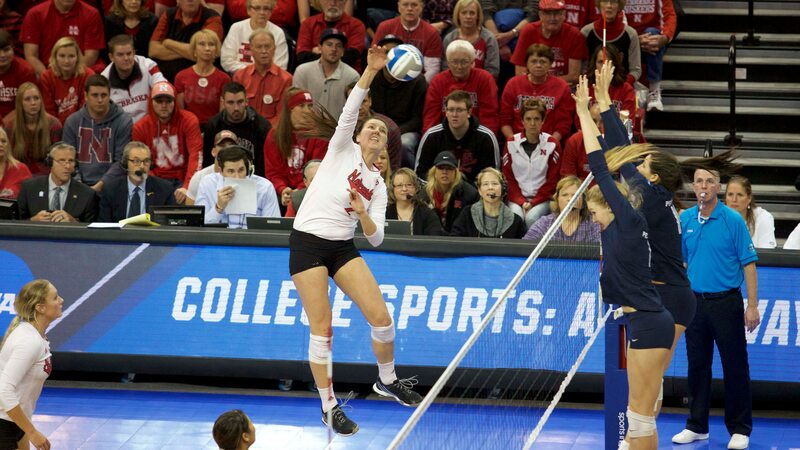 The Huskers finished off the 25-19 win on a Sweet kill.